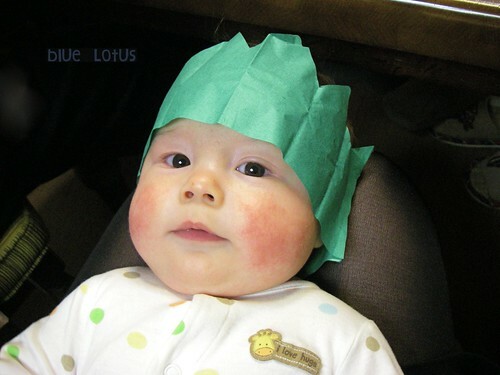 What I did for Oshogatsu (the new year holidays): spent nine babyriffic days with my in-laws in Osaka. You'll recognise one of those babies in the picture above. The other baby is his cousin. 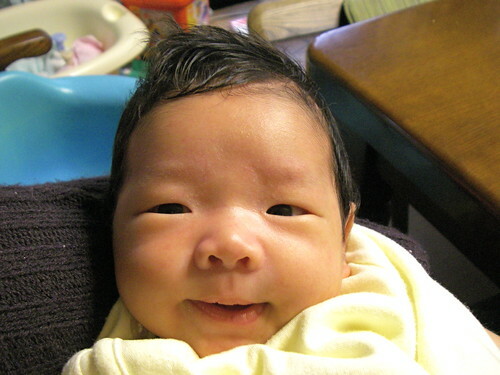 Meet Yuuki, my three week old nephew. 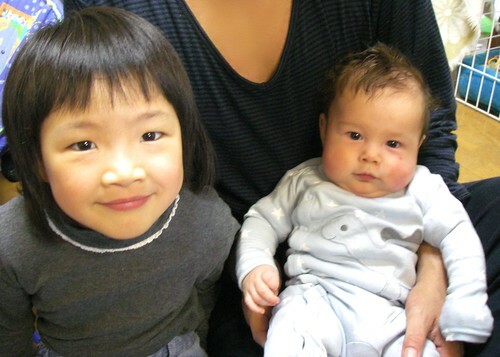 He was there with his mom (Hideaki's sister) and his big sister, Marya. It was highly entertaining sharing a roof with two babies and a five year old, and not nearly as noisy as I'd imagined. In fact, every time we heard a baby crying we knew it was Shuma, as Yuuki barely cries at all- he just gives the occasional, very polite, little whimper. 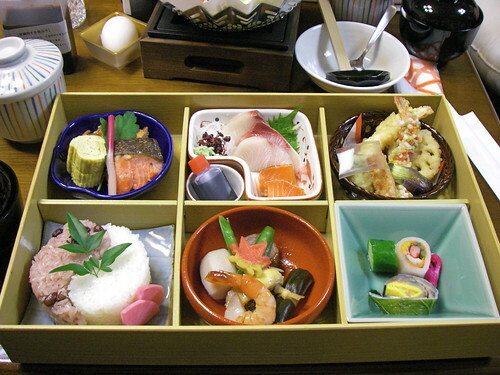 My visit started with a fancy double-decker bento, full of tasty morsels too numerous to list here. The next night we had tonyu nabe (soy milk hotpot), which was a first for me and is way better than it sounds, but like a lot of meals I was too distracted by the baby to take pictures. I'll be trying it at home soon and will be sure to blog about it then. 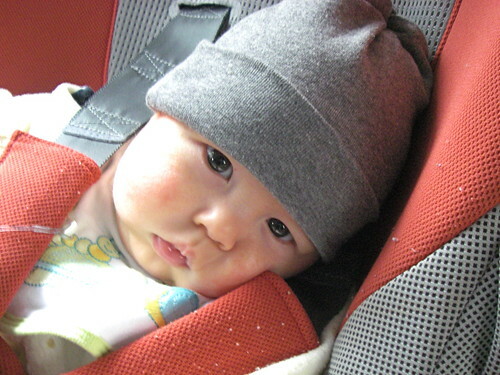 Shuma had all kinds of firsts in Osaka, starting with his first time riding in a car seat. After a bit of crying he seemed to like it, and it was one of the few places he was able to nap. Now I really wish we had a car! He also had his first experience sleeping on a Japanese style futon. Considering he continued to sleep well at night (and refuse to nap during the day), I think he liked it. Other developments included a dramatic increase in the use of his hands, and the first time playing with a toy all by himself. This Very Hungry Caterpillar became a favourite. 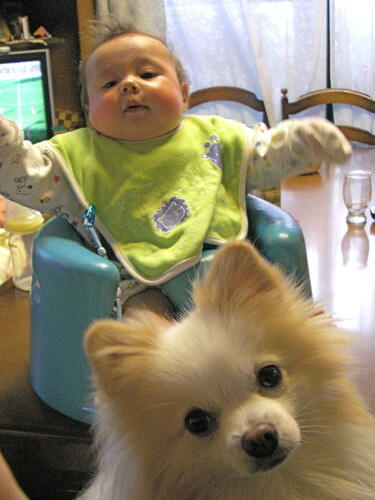 He met his first doggy, a pomeranian named Shiro. They became good friends and Shuma was on the receiving end of many a sloppy dog kiss, which delighted both him and Shiro. And a very exciting first: snow! 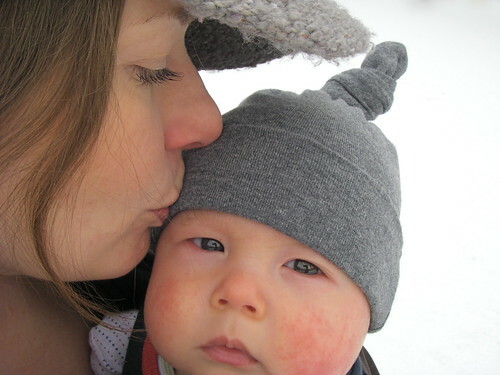 We had one day of snow, and it was actually cold enough to build up a little, so of course we went out for a walk. His reaction? 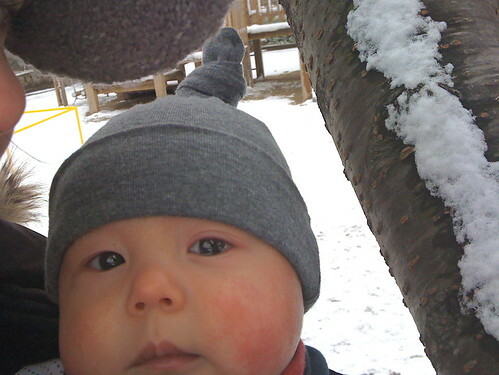 He wasn't impressed by the whiteness of it all, didn't seem to like the cold, and had no reaction to a bit of snow on his cheek. I'm not a winter person at all, but I was a wee bit disappointed. But he's half Canadian, so he'll learn to love snow eventually I'm sure. The best first of all was him meeting Yuuki. Like all babies they loved looking at each other. 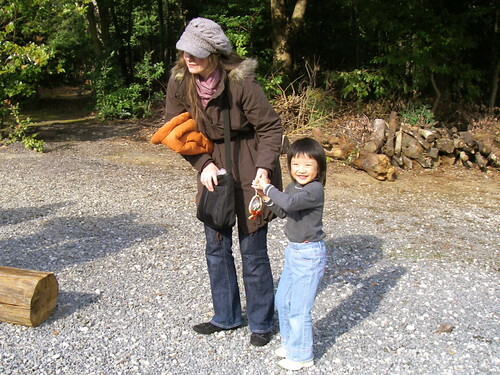 In Japan, New Year's Eve can sometimes seem a little anti-climactic, but for the last several years ours have been very fun. In addition to the traditional toshikoshi soba (year crossing noodles) we feast on crabs sent from my brother-in-law in Hokkaido. No pictures this time as I was busy taking care of Shuma and cracking crab legs. But wow, were they ever good. 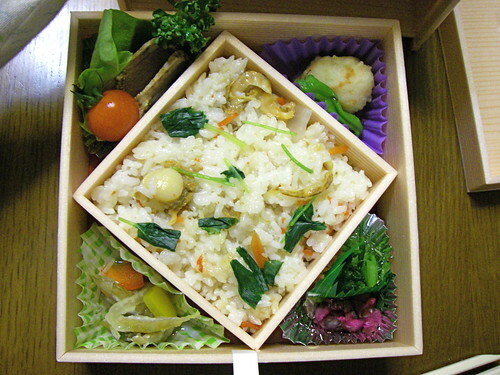 The new year begins with three days of osechi (traditional new year's food). 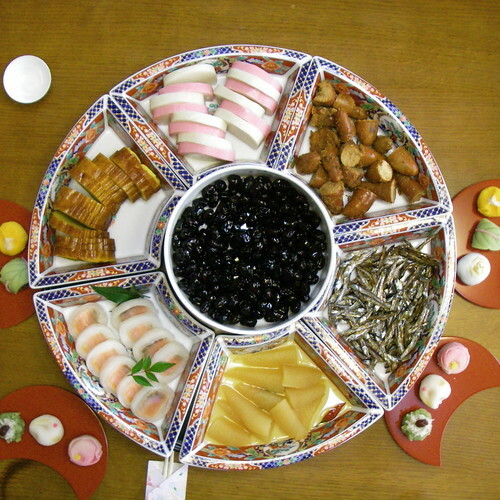 Osechi are heavily seasoned and meant to last throughout the holidays, and most are symbolic of various wishes for the year, but as I've explained some of them in past years (here's last year's) I think I can skip it this time. 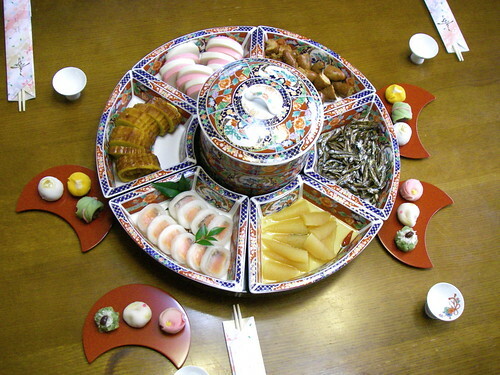 Osechi is usually served in a multi-layered lacquerware box, but my in-laws favour this revolving server. 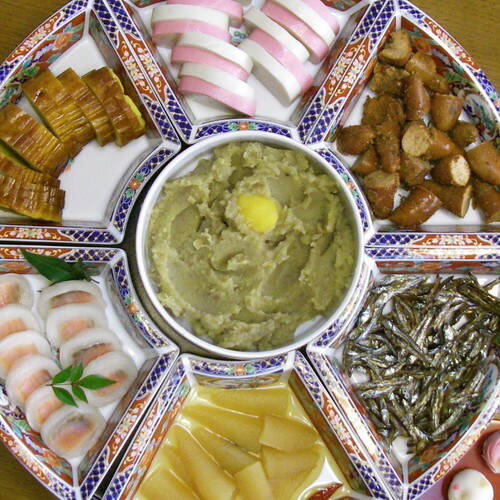 Above we have, from top, kamaboko (steamed fish paste), tainoko (bream roe), gomame (glazed baby fish), kazunoko (herring roe), sake no kaburamaki (thinly sliced daikon rolled around salmon), datemaki (thick rolled omelet), and kuromame (black soybeans) in the middle. 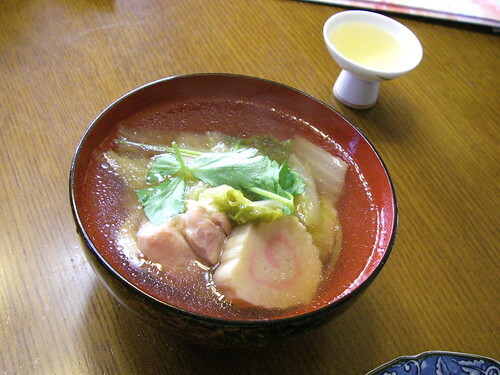 Kuromame are flavoured with soy sauce, while the shiromame (white beans) above are sweet. Kurikinton is another sweet one, made of mashed sweet potatoes and chestnuts. New this year was the kaburamaki, which was marinated in vinegar so nice and refreshing with all the other heavy flavours. 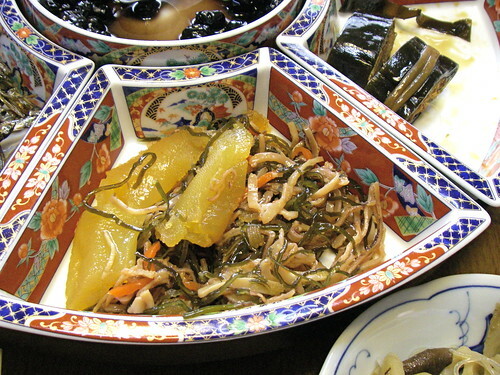 This is matsumaezuke, which is pickled kazunoko (herring roe), konbu (kelp), sakiika (dried skid) and carrot. It's homemade and very good, and the only way I like herring roe. 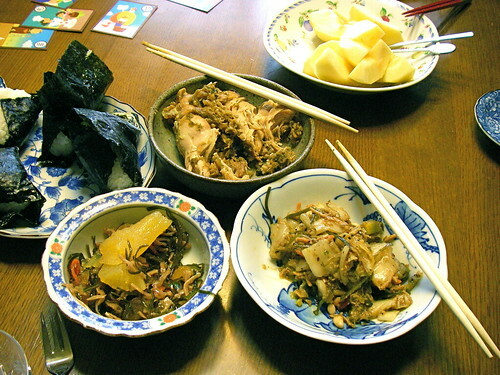 Above is more of the matsumaezuke, chicken braised with anise, and homemade kimchi. All excellent drinking snacks, and I would have done much more drinking if I hadn't had a little one to feed. 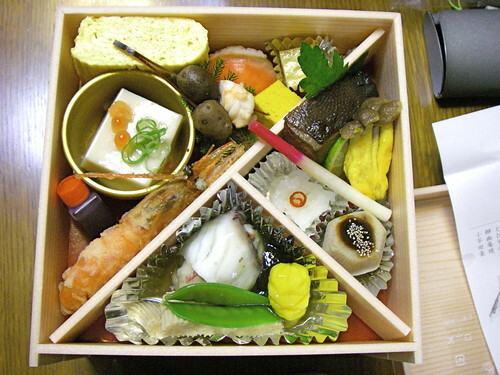 Other osechi included the umani (braised vegetables and beef) at bottom left, which includes the auspicious kuwai (arrowroot) and the namasu (pickled daikon and carrot) at bottom right. 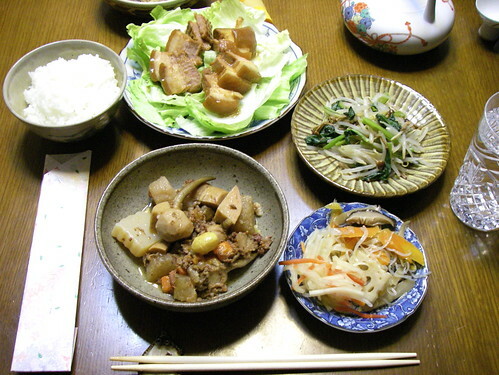 Usually for breakfast and lunch osechi is served with mochi (sticky rice cakes) while for dinner it is served with rice and non-osechi side dishes, like the buta no kakuni (braised pork belly) and stir-fried vegatables shown above. 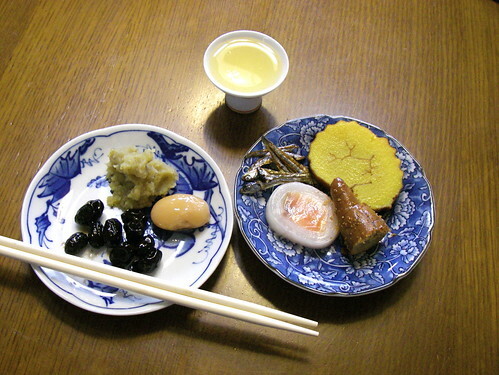 A meal of osechi always starts off with a toast of otoso, a syrupy concoction of sake steeped in sugar and medicinal herbs. 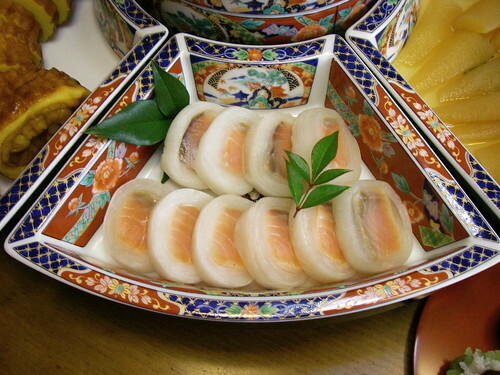 The mochi is usually served in ozoni, a clear soup with chicken and vegetables (at least at my in-laws' house- the soup varies depending on the region and family). 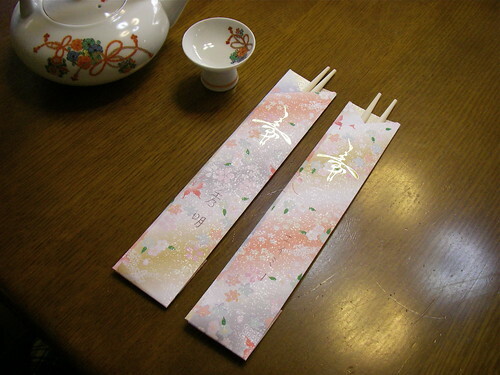 Osechi is always eaten with brand-new chopsticks served in pretty paper wraps. The ones above have our names on them. New Year's Day is doubly special for us, because it's also my father-in-law's birthday. 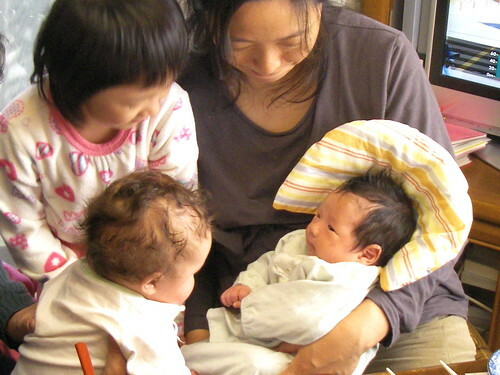 He turned 77, which is a big deal in Japan and normally we would have gone out to celebrate, but with a brand-new and almost-new baby we stayed home and had a feast delivered. It came in several huge boxes, with everything already plated- all we had to do was set the table (and wash all the dishes before they were picked up the next day). The meal started with a tray of pretty appetisers, above, along with suimono (clear soup) and chawan mushi (savoury egg custard). 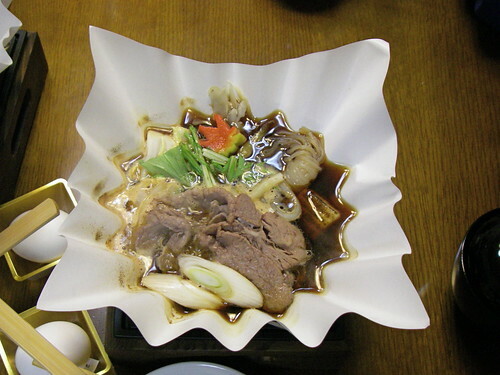 We each had our own servings of sukiyaki that came on little burners. 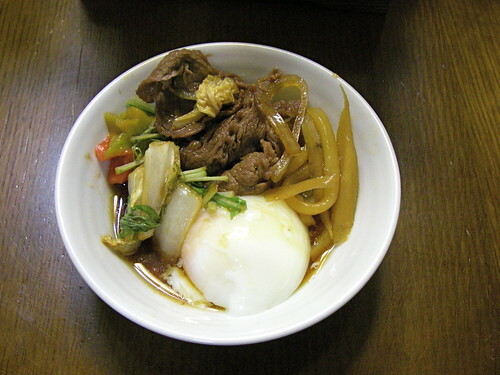 Here's the sukiyaki served with the onsen tamago (poached egg) provided. A very nice meal, but hopefully we'll all be able to go out for FIL's next auspicious birthday, his 88th. 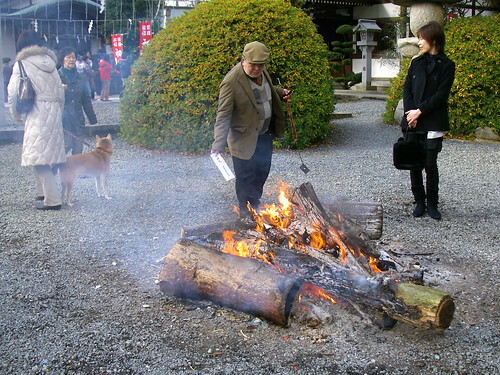 The next day we tried to do hatsumode (first prayer of the year) at a local shrine, but the line-up was too long so we just bought a few snacks at the yatai (food stalls) and added some fuel to the dondonyaki. 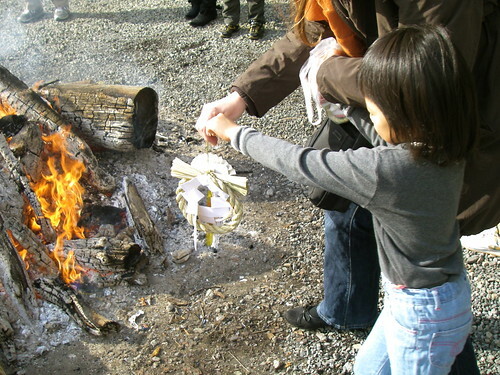 Dondonyaki is a fire on which last year's New Year's decorations burnt. Marya was in charge and did a fine job. She was hardly scared of the fire and very proud of herself for getting up close. Hideaki didn't get any time off for the holidays, so just came for one night. While we dropped him off at the airport we took a few lame pictures. They had a clearly male ground crew member, a clearly male pilot, and two nearly identical skirted and high heeled stewardesses. Did we just ring in 2011, or 1961? Hideaki is mildly obsessed with those ground crew workers who direct taxiing airplanes (there's got to be a proper name for them), so that's what Shuma got to be. Shuma had way too much attention to really notice his daddy was gone. 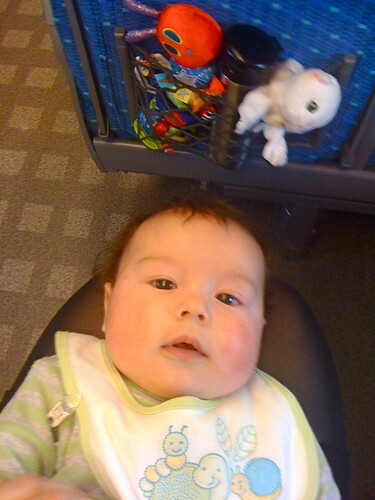 He had a special seat which he sat in, with the help of a Bumbo, and he took to sitting in it with his arms on the armrest, which earned him the nickname of "Shacho" (president). 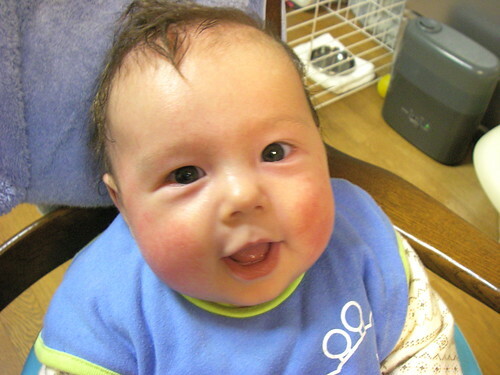 Yuuki was just starting to give those fleeting newborn smiles, and I managed to catch one. He felt so tiny when I held him, and it was hard to believe Shuma was the same size just three months before. 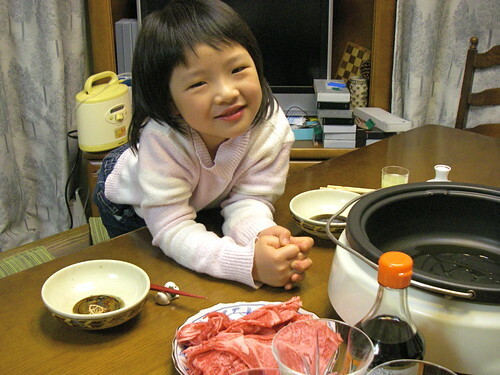 For our last night we had homestyle yakiniku (a Japanese version of Korean bbq), which is cooked on an electric griddle at the table. This could very well have been the best beef I've ever had. 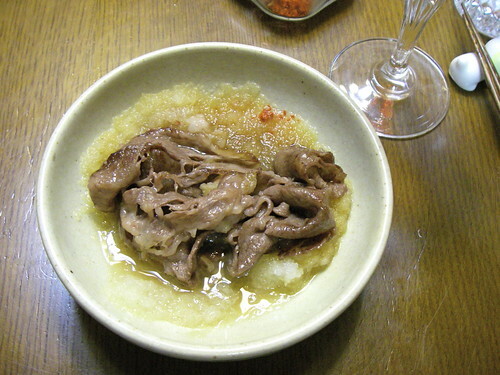 Instead of the usual yakiniku sauce, we had oroshiponzu (grated daikon with ponzu, a soy-citrus sauce). Delicious! On the bullet train ride home Shuma was a very good boy, which was a relief as I was not looking forward to being on the receiving end of stink eyes from other passengers annoyed by his crying. I hope our first flight goes this well. 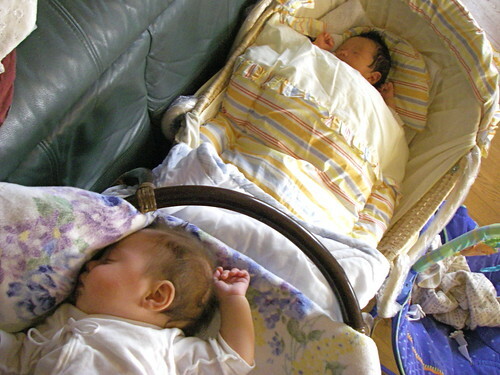 It was hard for both of us to get used to being back home- hard for me to get back into doing my own cooking and laundry, and hard for Shuma to adjust to the lack of non-stop noise, excitement, and attention. But I think we've got the hang of it now, and he's even napping once in a while. I hope it's a skill that he gets better at in 2011.
looks like you had a great holiday! That looks like a wonderful holiday. And how nice that Shuma has a cousin so close in age! Ooh, I've been looking forwards to your oshougatsu post! It looks like you had a wonderful time. Keep up the great work, All the Best! 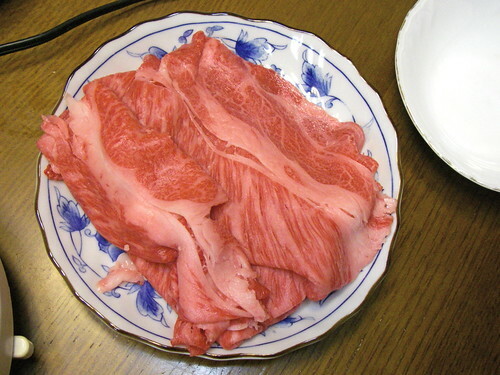 I love your oshougatsu post last year and have been looking forward to your 2011 oshougatsu post! 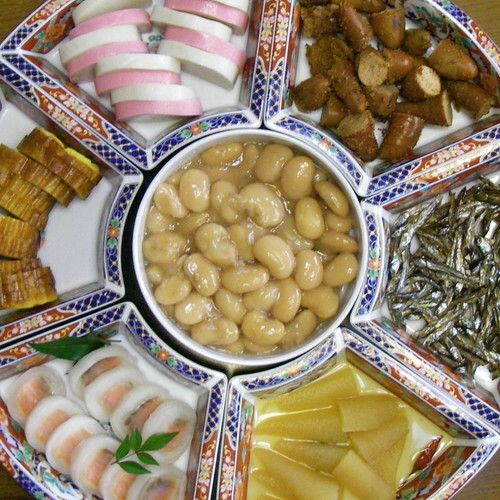 The food this year looks really sophisticated and it has given me a few ideas on what to cook for our Chinese New Year feast in 2 weeks time. 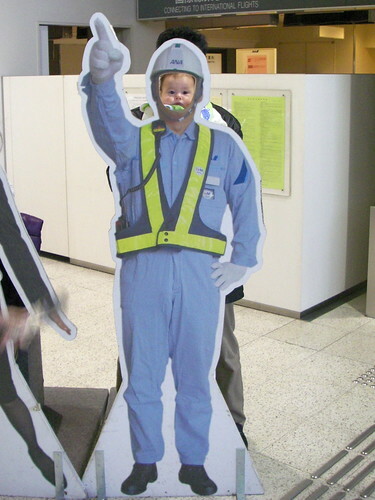 Shacho Shuma is absolutely adorable as he grows and learn how to use his hands! Happy new year! Love the blog posts as always, have been reading you for years and plan on doing so for more. 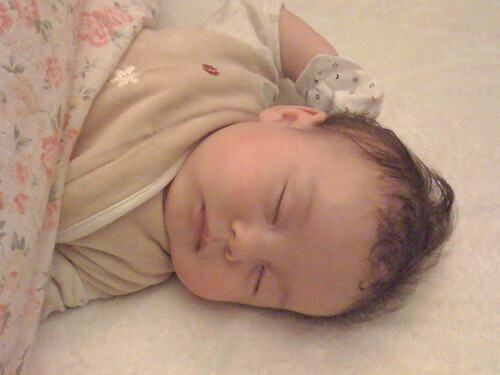 Shuma is the kaichou of cuteness -- I don't particularly think most young babies are cute, but he is definitely a looker! Happy New Year! A great post, I really enjoyed it. 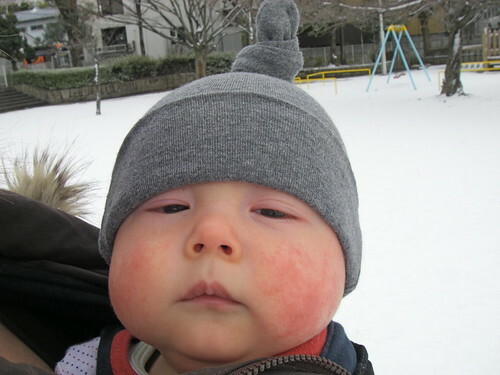 Shuma-chan's expression out in the snow was just too much! Our in-laws had a Pomeranian too. Taku's first meeting with their dog wasn't as peaceful, though, Taku got excited and picked the dog up by his back fur :-0 They did not become friends until quite a while later! Les parents d'Ideaki sont comblés, deux beaux petits-fils presqu'en même temps! Miam, toute cette nourriture est tellement appétissante.. C'est toujours un plaisir de lire votre blog! love it, the food looks amazing this year too, and even better with little babies sprinkled throughout :D Love the one with shuma meeting his cousin and the one in the snow completely unimpressed lol. Whenever I know there'll be some nice drinking I try and express milk in the morning..have you tried this? It's nice for that 1 big drinking binge (2 glasses lol).